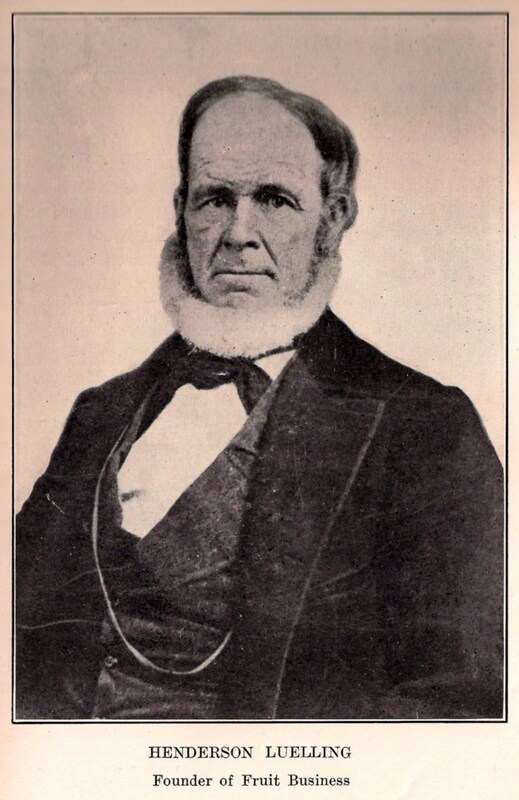 On December 28, 1878, “Father of the Pacific Fruit Industry” Henderson Luelling died in Oakland, California. Born in Randolph County in 1809, Luelling was a Quaker active in the Underground Railroad before he risked his life to take fruit trees to the West Coast via the deep-rutted Oregon Trail. Also known as the Johnny Appleseed of the West, Luelling moved to Salem, Iowa in 1837, where he and others established the Abolition Friends Monthly Meeting and where a trap door in his house led to a haven for fugitive slaves. In 1847, Luelling, traveling by ox-team, left Iowa in a seven-wagon caravan with his wife, eight children and 700 grafted fruit trees, primarily apples but also pears, cherries and peaches. Half of the stock of trees, buried in a compost of soil and charcoal, died en route as did two of his oxen. With the assistance of Indian guides, Luelling arrived in the Williamette Valley drawn there by the writings of John C. Fremont and the accounts of Lewis and Clark. He established a nursery, sold thousands of trees in Oregon and California, and brought several new varieties of fruits to the market. His brother Seth, who accompanied him, introduced the Bing cherry.